Artificial intelligence will likely become as successful as the ‘90s architecture “client server.” So let’s recall that one piece of our history, every bit as confused and full of hype as AI. In the late ’80s, many companies used mainframe HRIS software. A handful of vendors offered it on various minicomputers or PCs, often standalone or in small local area networks. Then along came PeopleSoft in 1989, declaring it had a new architecture called “client/server” that did away with the very expensive mainframe. As PeopleSoft gained traction in the market, every mainframe vendor raised its hand to shout: “Me, too, I’ve got client/server!” Of course, there were honest disagreements over what client/server meant. Oracle, for instance, showed a client/server HRIS in 1990 without a graphical user interface, not foreseeing it would turn out to be the new architecture’s most popular feature, at least with end-users, if not IT. Oracle eventually pulled the software from the market. Even within the bounds of varying definitions, some of the offerings were laughable. My favorite was Dun & Bradstreet Software (comprised of mainframe leaders MSA and McCormick & Dodge) at a trade show with a seven-foot-high rack of equipment in its booth in order to demonstrate its so-called client/server! The analogies to the current state of AI are almost too perfect. I don’t know which one is the modern PeopleSoft, but once again every vendor is yelling “Me, too, I’ve got AI!” And almost nobody agrees on what that umbrella term actually means, including full-time AI experts. There were 2,300 attendees at the recent AI World Conference in Boston, with reportedly half as many differing opinions. Bersin’s Christa Degnan Manning offers a perfect AI primer in her six-minute video on Firing Line with Bill Kutik®. Let’s take a look at one of those recruiting vendors, Paradox.ai. John didn’t cover it in his report, but I chose it because it has a “digital assistant,” one of the more common ways we will first experience AI or whatever you insist on calling it. Digital assistant is itself muddled by the various labels used for it: bots, chatbots, robots, intelligent assistants, voice-activated assistants. Let’s eliminate voice from the conversation. When my Amazon TV perfectly understands my spoken request to find 2001: A Space Odyssey, (to watch HAL, the ultimate AI dream from 1968 of a fully autonomous computer, now not expected to be realized until 2027), the problem of translating voice to text has pretty much been solved. The fact is voice to text is not yet perfect. Everyone with a home spy device from Google or Amazon knows this, as does anyone who dictates email or text on a smart phone. Looking at the iPhone’s garbled beta transcripts of voice messages just means we all must now assume everything is transcribed, and therefore speak more slowly and distinctly. Separate is natural language processing (NLP) which vendors can’t buy from Google and are solving themselves. That’s the much thornier problem of the software understanding what the perfectly translated text actually means and what it should do in response. Easy enough when you’ve clicked a button on a laptop screen. Not so easy when you can ask in at least a dozen ways what you got paid last week! You’d imagine that’s one of the simplest requests around, but it’s actually making ADP work pretty hard. Paradox is, for the moment, solving one of the larger but simpler problems in talent acquisition: high volume, low complexity hiring. That is its current sweet spot, according to company Evangelist Rob McIntosh, a long-time recruiting expert. The company has more than 100 customers, including large employers such as CVS, Sprint and Delta. The Paradox system presents candidates with “Olivia, your virtual job assistant,” complete with a picture of a friendly-looking woman and no jive that she’s real. Of course, on the company’s website for prospective buyers, she is “Olivia, the AI assistant.” Today’s magic acronym. Whatever. Olivia is a simple digital assistant that starts the candidate experience. It asks questions and gets answers in a standard chat format via the phone or desktop. Pre-screening can include up to 20 questions (straight off a traditional job application to my mind). Depending on the candidate’s answers, it then branches to other questions, using NLP to understand longer answers. It can also find the candidate’s LinkedIn profile, which is either “robotic processing automation” or “swivel chair automation,” depending on your preferred term. Both refer to finding and taking data from one system and either linking to it or putting it into another system with no human fingers touching screens or keyboards. Imagine sitting in a corner with a screen on either side to get the “swivel.” If that’s basically your job right now, time to get some new training fast. 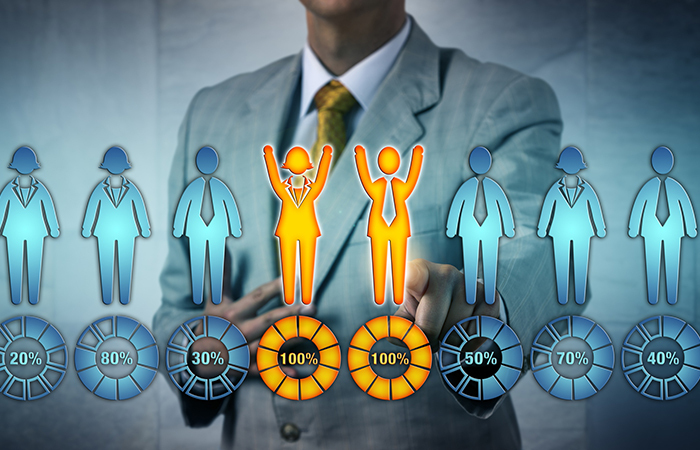 Like the very best applicant tracking systems, Olivia can be told who your organization’s top competitors are and fast track any applicant to a human recruiter who has worked for one. The same for anyone with skills you desperately need. Olivia gets more interesting with the “Schedule” module, negotiating a time for a phone call or personal meeting between the candidate, recruiter or hiring manager. And even sending chatty reminders. This is a standard digital-assistant function outside of recruiting, too—a huge time-saver for anyone whose workday is consumed by meetings, conference calls or even private scheduled calls without a human assistant to set them up. With the “Ask” module, Olivia can handle lots of different questions, such as company culture and job details or however much text the client is willing to write. If the answers sound canned, that’s the client’s fault. But it can approach free-form conversation and by using Google’s translation services, this and other functions can take place in 73 languages. The final module—maddeningly named ERP (probably because of the first client’s insistence) —handles the employee-referral process. Clearly, what Paradox is doing allows recruiters—who should be handling the candidate outreach—to work more efficiently at the narrower part of the funnel, where the active candidates are much fewer. The term for that is “cognitive augmentation,” helping someone do a job better. On Jan. 18, Paradox announced a partnership with SmashFly Technologies and its well-regarded recruitment marketing platform, with the stated aim of merging functionality! While that rarely happens without large amounts of money changing hands, Olivia may soon be showing up in a lot more places than client/server ever did.